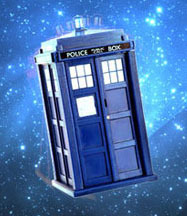 Last month news broke that the first episode of the new season of Doctor Who had leaked online. Reports that the second episode was also available faltered with no full copy publicly circulating online. That has now changed, with an unfinished workprint copy of 'Into the Dalek' now doing the rounds. Last month the file-sharing leak phenomenon hit the upcoming season of Doctor Who. Following a catastrophic error at a BBC office in Miami, not only were the new seasons’ scripts made available to the public, but several episodes too. It’s unclear how many people downloaded the videos directly from the server, but it soon became clear that episode one had leaked when it appeared on The Pirate Bay and other file-sharing sites. It was an unfinished ‘workprint’ release, destined for Marcelo Camargo of Marc Drei Productions, a Brazil-based production company known for its subtitling work. The image below shows how the content appeared on the BBC website. Soon after rumors turned to a potential leak of episode two. A torrent was certainly uploaded to The Pirate Bay, but whoever seeded that file in the first instance quickly backed away, leaving the torrent at just a few percent complete. This led many to presume that the release was a fake, but that wasn’t to be the case. A full copy was definitely waiting somewhere. On Sunday at least one torrent sprang back to life temporarily, surprising people who had patiently left it in their client to complete. While it reportedly went quiet again, another torrent appeared claiming to be of the same material. As both torrents completed confirmation arrived that the leak, which had lay dormant for several weeks, was indeed real. 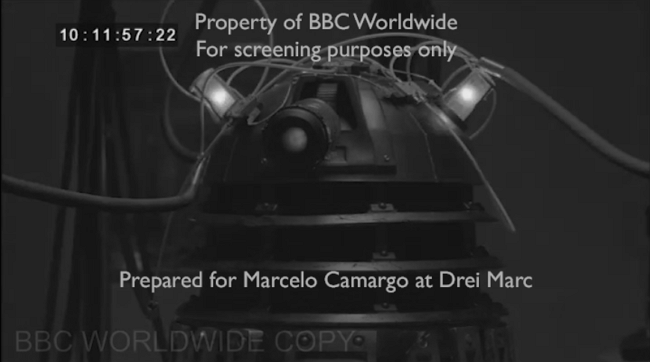 Weighing in just short of 987MB, the episode is called ‘Into the Dalek’ and once again it is another unfinished ‘workprint’ copy, as the screenshot below shows. In addition to being covered in text watermarks, the episode is presented in black and white, with many special effects absent. Its naming convention matches the screenshot above, suggesting that this leak was also obtained from the BBC website. While the BBC will be disappointed not to have contained this second episode, there are currently no signs that any of the remaining episodes have leaked to file-sharing networks. The leak is only the latest in a long line of workprint copies of movies and TV shows to be made available online. It certainly won’t be the last.